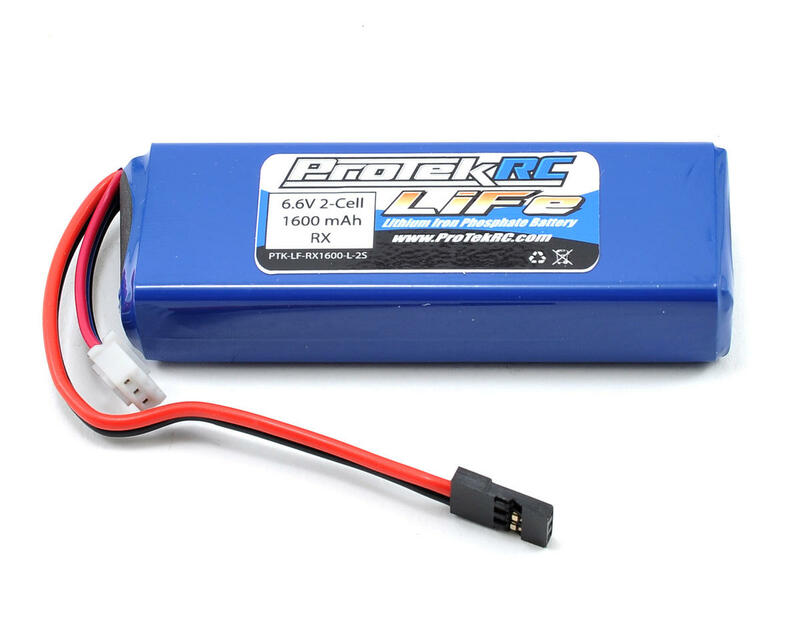 This is a ProTek R/C 1600mAh LiFe Flat Receiver Battery Pack. Lithium battery technology is evolving. With cell dimensions that fit anywhere a standard Li-Poly battery will and rapidly increasing capacity, LiFe chemistry will soon set the standard that all others are judged by. With the ability to deliver 1000+ usable cycles, and a life span up to 4 times longer than Li-Poly batteries (when cycled under the same discharge conditions), these batteries offer the user an excellent balance of performance and value. LiFe batteries are more durable than Li-Poly and are able to handle a higher level of abuse when compared to Li-Poly without the risk of pre-mature failure. Unlike Li-Poly, LiFe cells can be stored in a fully charged state with little to no loss in stored power, and can be discharged deeper with less risk of damage to the cells. Most importantly, LiFe batteries are SAFE! There is no risk of combustion! LiFe cells will not catch fire or explode when over charged, or after a deep discharge. A 2 Cell LiFe battery produces 6.6 volts nominal, which is almost a full volt less than a 2 Cell Li-Poly battery. The LiFe battery is not meant to replace the performance of a Li-Poly battery, it is simply another option. LiFe offers the user a battery with a good discharge curve that is better than that of a NiMH battery, but without the risk of damage or fire that exists when a Li-Poly battery is abused. Additionally, when used as a receiver pack, a LiFe battery eliminates the need for a voltage regulator, which reduces the risk of failure by eliminating a component that could potentially fail. This LiFe pack fits perfectly in an Airtronics M12 and works really well as a transmitter battery. I use this battery as a tuning option in my buggy. 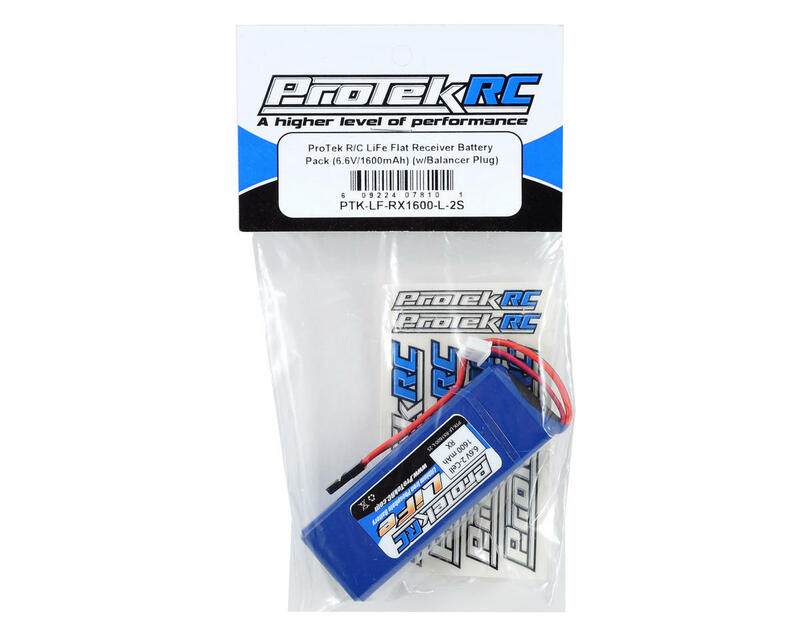 If your Lipoly battery feels too responsive for the track conditions, drop this battery in for a smoother feel. Nice quality construction with good connectors which is important in a gas buggy. Bought on sale for 20 to use in my Futaba radio. Perfect!! I was paying $10 for energizer lithium 4 pack, so well worth the money. I have used this battery for three seasons in my 1/10 nitro car. It has performed flawlessly' and holds a charge for three qualifiers, or 1 qualifier and a 30 minute main race. Not worth it. Me and buddy purchased these for our mbx6t. They both went belly up after about 6 races. Will not purchase again. So far I have received 3 of these, 2 of which have been replacements by amain. All three have been duds in a 4 week span. I will send this last one back and not purchase another protek.